Beds - The focal point of every bedroom! The focal point of every bedroom is the bed itself. With many options to choose, creating your personal sanctuary might need a little imagination. The size of your room often plays a role in the size of bed you should consider. For children and youth bedroom furniture, you might consider a twin bed or even bunkbeds to get more sleeping space from smaller areas. 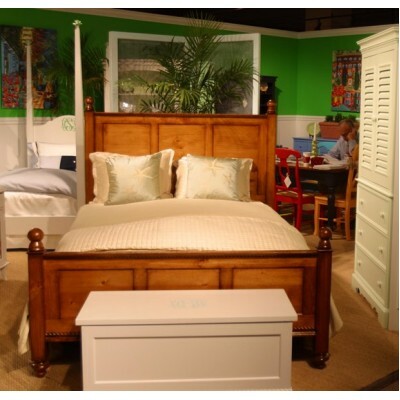 For adults, while many prefer a king bed, you might consider a queen bed to save on space. This also leaves extra room for night stands, dressers, or maybe a nice accent chair and end table to create a cozy quiet area to relax. Mixing colors and styles are perfectly acceptable, so enjoy the process. *Remember, we are always available to consult with you with you should you need any design help. Basket Weave Bed - Coastal Cottage Collection....Free Shipping including White Glove Delivery an..
Classic Coastal Look - Coastal Cottage Collection....Pacific Home Furniture’s Beadboard Be..
Cape Cod Bed - Coastal Cottage Collection-Pacific Home Furniture’s Cape Cod Bed is co..
Classic Bed - Coastal Cottage Collection....This Classic Bed from Pacific Home Furniture ha..
Dockside Bed - Coastal Cottage Collection....This Dockside Bed from Pacific Home Furniture ..
Oglethorpe Bed - Coastal Cottage Collection....Pacific Home Furniture’s Oglethorpe Bed&nbs..
Classic Styling Pencil Post Bed - Coastal Cottage Collection....This Pencil Post Bed from P..
Enchanted Canopy Bed - Coastal Cottage Collection....This Seabrook Canopy Bed from Pacific ..
Classic Seagrass Bed - Coastal Cottage Collection....Pacific Home Furniture’s Seagrass Bed..
Seaside Bed - Coastal Cottage Collection....Free Shipping Including White Glove Delivery and Set..
Shutter Bed - Coastal Cottage Collection....This Shutter Bed from Pacific Home Furniture co..
Signature Bed - Coastal Cottage Collection....This Signature Bed from Pacific Home Furnitur..
Lovely Coastal Design - Coastal Cottage Collection....This Slat Bed from Pacific ..
Victoria Bed Modeled after French-inspired furniture found in the European Countryside,..